Dehydrated/combo/dull – pretty much all skins. Good for perioral dermatitis, used on top of hyaluronic serums. It doesn’t really have one, it’s extremely mild. It smells like skincare, if that makes sense? Apply after serums or oils. Under SPF. This is best used however, on top of similar products like hyaluronic acid serums. Lush. Either – whenever you’re dehydrated or want an oil-free moisturiser. £50.50/$58.00 for 50ml. Should last a couple of months depending on whether you use am or pm, or both. I bloody love this moisturiser. Keeping with the hyaluronic acid focus, it’s light, yet hydrating. Absorbs beautifully, feels soft on the skin. It’s not in any way sticky, and most importantly, it works absolutely brilliantly on top of hyaluronic serums. 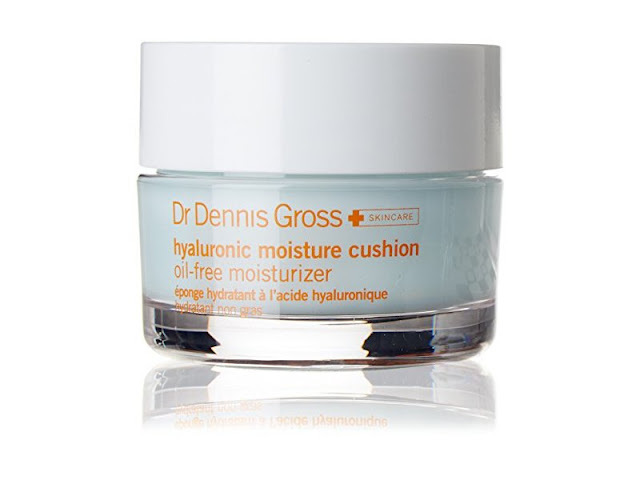 Skin feels literally cushioned with moisture, probably hence the name.. If you find that your skin needs ‘something else’, but a heavy moisturiser breaks you out, this might be what you are looking for. It has a teeny bit of glycolic and lactic, and not just as preservative levels, which gently exfoliate (absolutely no sting), thus allowing the HA to penetrate even further. It’s not too heavily siliconed, as a lot of oil-free moisturisers are, meaning that you can layer products without the threat of ‘rolling’. Not much to raise as a negative. It’s honestly a lovely moisturiser. If you’re super dry, you may need a moisturiser with oil. Yes. Especially if you are dehydrated, really oily, really confused, really anything to be honest. $58.00 from DrDennisGross.com – but there’s currently a 20% Friends & Family discount online! *This post contains some affiliate links. If you are happy to click on them and support the blog, thank you very much. If you would rather not, just google the product. It’s all good. I do not use affiliate links with brands that I work with on a professional basis, such as Dennis Gross.